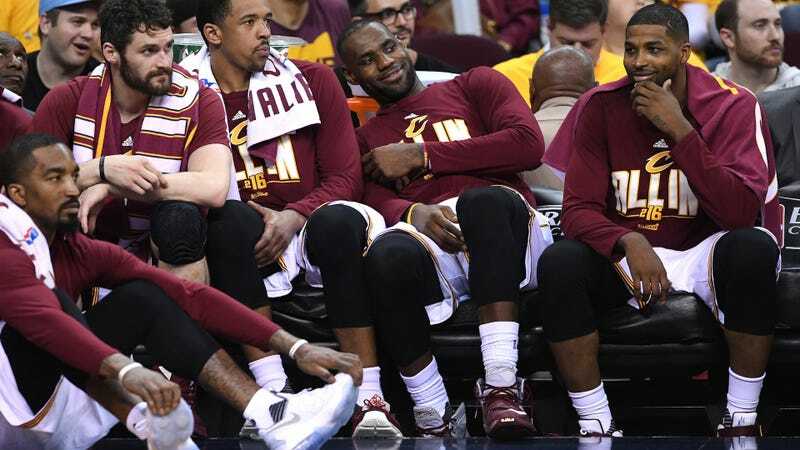 Jeff Van Gundy: Resting The Cavs' Big 3 Should Be "A Prosecutable Offense"
Before last night’s nationally televised game against the Clippers, the Cavaliers announced that they’d be resting their three best players. LeBron James, Kevin Love and Kyrie Irving took a seat while L.A. breezed to a predictably easy victory. The NBA was, just as predictably, not pleased. Clippers coach Doc Rivers criticized the move—“There is a fan base that probably bought tickets tonight to see LeBron James play for the first time. They didn’t get a chance to see that, and that’s not cool”—even though he’d just rested his own superstar, Blake Griffin, on Thursday. Cavs coach Tyronn Lue stood by it, noting that the team is in the middle of a six-game stretch in nine days and that both Love and Irving have injury concerns. Seeing stars sitting on the bench for two weeks in a row led Mark Jackson and Jeff Van Gundy to call players resting “an absolute joke” and a “prosecutable offense,” respectively. On the one hand—bad basketball is, in fact, bad. On the other—saying that teams look out for the players by giving them rest, but who will look out for the fans??? is perhaps not the best way to make that point. Should The Warriors And Cavs Be Getting Worried?